Send a child with type 1 diabetes to camp! Camp Blue Hawk is a 5-day residential camp for children with type 1 diabetes that focuses on improving our camper’s quality of life. We do this by: increasing patients’ confidence and diabetes self-management skills; enabling children with diabetes to meet and share their experiences with each other; providing respite for families of children with diabetes; and most of all, having fun! We are excited to offer a medically-safe camping environment, supervised by OU Harold Hamm Diabetes Center - Children’s board-certified pediatric endocrinologists, certified diabetes educators, nurses, registered dietitians, clinical psychologists, pharmacists, and medical counselors. These staff work together to create a camp experience that allows children with type 1 diabetes to connect with each other and learn valuable life skills, while also having the kind of fun associated with a summer camp, such as archery, hiking, arts and crafts, swimming, canoeing, ropes course and more. Diabetes camps were the first illness-specific camps created; while the introduction of insulin changed what was once a terminal illness into a manageable disease, it required a tremendous amount of education to manage diabetes effectively. Camp Blue Hawk uses experiential and structured learning to instill self-discipline, promote self-confidence, and impart good disease management skills to prevent long-term health complications caused by type 1 diabetes. In addition, camp staff provide campers opportunities to work on character, self-esteem and self-confidence, all of which are critical components of child development and disease management. In both our OKC and Tulsa clinics, we see a number of children who would benefit from camp, but cannot afford to pay for camp attendance. In fact, about 60% of our camper population experience significant financial barriers to attending a summer camp. While we do charge for campers to attend, no child is ever turned away because of a lack of financial resources. Your support of our campaign help us maintain that standard and care for as many children and teens as possible. It costs about $500 to send a child to diabetes camp - between the fun, camp experience and the medical supplies, medications, and expert personnel required to run a safe camping experience. Please consider making a gift – any amount helps us send another camper to camp! Other ways you can help include sharing this campaign through your social media or email relationships, or volunteering your time! Every dollar, share, or volunteer hour go a long, long way towards helping children with this chronic illness. Thank you!! Your support at this level will cover the cost of a camp t-shirt for a camper. 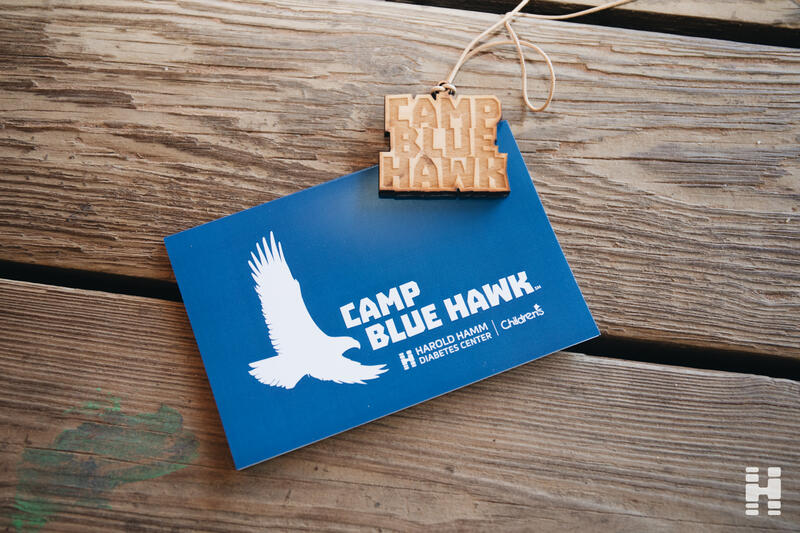 Each year campers receive shirts that have the Camp Blue Hawk logo and theme design on them. Your gift of $10 helps kiddos stay distracted on those rare occasions that they are stuck inside! Whether from rain, illness, or just rest time, activities such as books, puzzles, and cabin crafts go a long way towards keeping campers happy! Help us prevent that hungry feeling through a $25 gift! These funds can go toward snacks and drinks to keep campers full and hydrated. Uh oh! Your gift of $75 helps us purchase necessary supplies for the infirmary, not only for diabetes management, but also in case of any slips, trips, or falls! The target blood sugar for our kiddos at camp is between 80 and 150. Your donation of $150 provides 3 campers with a variety of low blood sugar treatments for the entire week! Help us cut down on the number of kiddos with type 1 diabetes who can't come to camp! Your donation of $500 will send one more child to camp for the full week! This year Camp Blue Hawk will be at an ALL NEW CAMPSITE in Wewoka, OK! Your donation of $1000 will help us cover the cost of our new location and all the fun it has to offer!